Premarkets: Dow ready for another record high? Stocks: Dow ready for another record? Markets look set to ignore rising tension in Ukraine Monday and the Dow Jones industrial average could power forward to new record highs. Major world markets and U.S. stock futures were all moving up ahead of the opening bell, shrugging off Sunday's vote in a region of eastern Ukraine showing an overwhelming majority in favor of independence. Ukraine and several Western countries have condemned the referendum, organized by pro-Russian separatists. 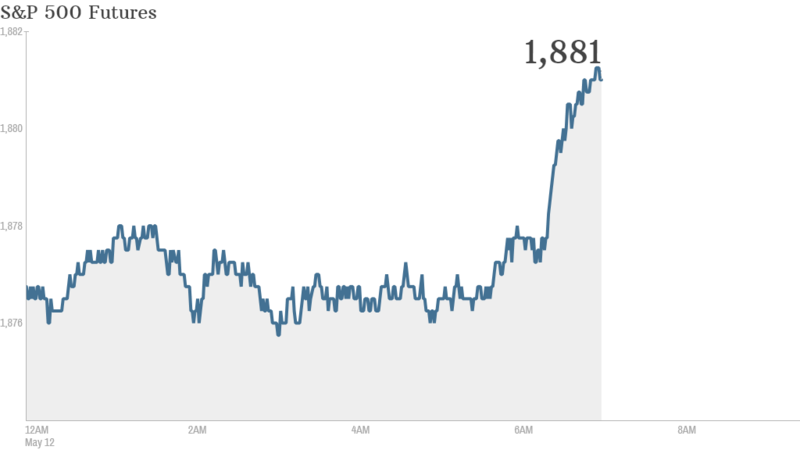 The major U.S. stock indexes all pushed up Friday. The Dow's close of 16,583.34 narrowly topped the previous record set on April 30. The S&P 500 and Nasdaq also closed firmly in positive territory. There are no major quarterly results coming out Monday. But a number of retailers including Macy's (M), Wal-Mart (WMT) and J.C. Penney (JCP) will report later in the week. In economic news, the April Treasury budget will come out at 2 p.m. ET. European Union foreign ministers will discuss the situation in Ukraine on Monday, but are unlikely to announce any new sanctions against Russia or separatist leaders before Ukraine's presidential election slated on May 25. "The EU does not yet seem prepared to escalate the sanction regime to 'stage two,' which would allow it to include companies and organizations," wrote Marc Chandler, strategist for Brown Brothers Harriman, in a market report. "Disruption of the May 25 Ukraine election, however, would likely push the EU over that Rubicon." European markets were all trading higher. Most major Asian markets ended firmer. The Shanghai Composite index surged by just over 2% and the Hang Seng in Hong Kong rose by 1.8%. The Mumbai Sensex index also shot into record territory as India's marathon parliamentary elections come to an end. Exit polls are due to be published after the market close Monday.